In September 1900, George Fowlds, MHR for Auckland City, asked a question through Parliament which came to attract ire and controversy from Thames — and led to threats of legal rumblings from Auckland. This afternoon Mr Fowlds asked the Government if they were prepared to offer a bonus of £10,000 to any company formed with a paid-up capital of £60,000 for the purpose of converting- our kauri gum into marketable varnish, the bonus to be payable when 200,000 gallons of approved varnish had been produced. Mr Ward said he quite agreed with Mr Fowlds, and thought it was an industry that should be encouraged. The Government were prepared to offer a bonus, and the conditions, after due consideration, would be advertised in the Gazette. In Thames, the message somehow became garbled — a parliamentary question became a bill about to be introduced. Worse, said bill would appear to put the Auckland varnish works to an advantage over the one in Thames! The town’s point of view surely had to be expressed over such unfair treatment of a provincial industry. The matter was brought to the attention of the local council. Varnish Works Subsidy.—The Town Clerk drew attention to a Bill introduced in Parliament by Mr Fowlds, member for Auckland City, providing for a Government subsidy of £10,000 for the production of 60,000 gallons of varnish by the Auckland varnish works — a losing concern. 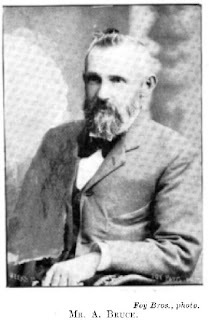 He suggested to the Council that representations should be made to the Government that the only fair way of granting a subsidy for varnish production, would be by making that subsidy an open one to the whole colony, so that any varnish works in New Zealand might take advantage of it. To grant the subsidy exclusively to the Auckland works would be a great blow to the Thames varnish works, which was a local industry. Cr Scott moved that representations be made to the Government as suggested by the Town Clerk. This was a kauri gum district as well as Auckland, and the subsidy should be open to the whole colony. The local works manufactured, beside varnish, various paints and black lacquer and quick shines. The Mayor seconded the motion, which was carried unanimously. The Thames Council’s Town Clerk, Albert Bruce (also instigator of the township’s School of Mines and the grant from the Carnegie foundation for their library -- Thames Star, 27 November 1909) put pen to paper. In hindsight, this wasn’t a wise move. The following letter was recently addressed to the Premier : "I have the honor by direction of the Thames Borough Council to point out to you the injury that may possibly result to the Thames paint and varnish industry should the request of Mr Geo. Fowlds, M.H.R. for Auckland City, be given effect to, viz : To grunt a bounty of £10,000 to an Auckland Company, should a company be formed with a capital of £60,000 and produce 200,000 gallons of kauri gum varnish. The Council, while opposed to the principle of bounty-fed industries, respectfully submits that if it is considered advisable by Government to build up any industry in the colony by the aid of bounties, competition should not only be thrown open to the whole of the world, but it should be made a condition that the article manufactured should be first-class. To subsidise any particular company would mean crushing out of existence any company, firm, or person engaged in unsubsidised industries of a similar nature. 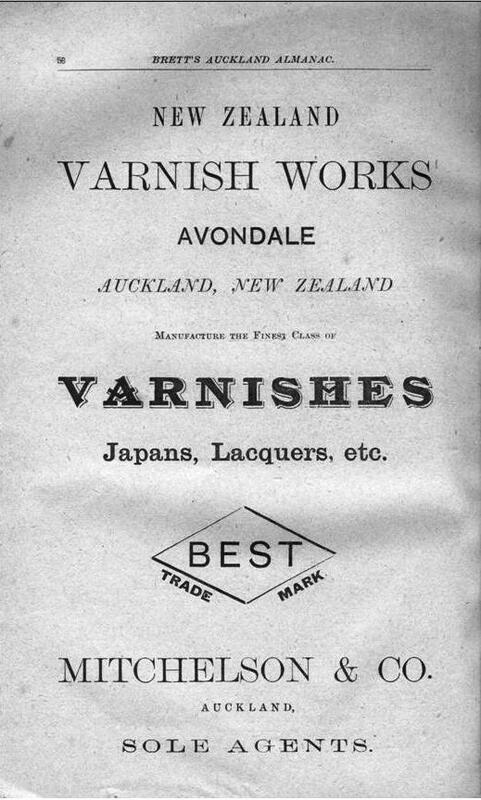 The Council are given to understand that one of the reasons the Auckland Varnish Company (the company sought to be subsidised) find it difficult to compete with the imported article is that they place their varnish on the market before it has had time to mature, and in consequence when used it takes a long time to dry. The Hon. 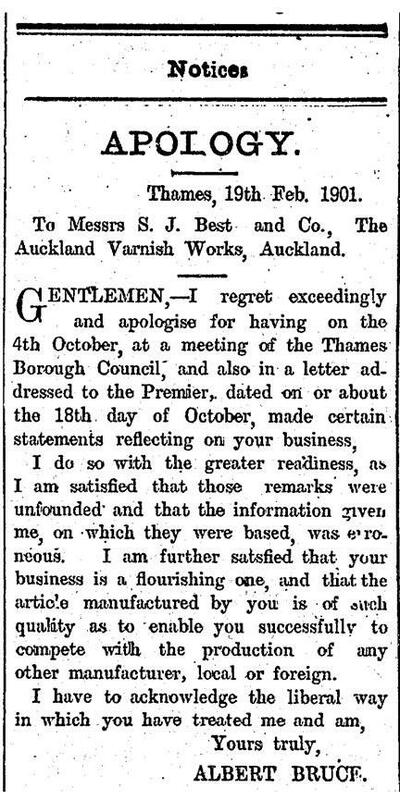 J. G. Ward wrote that the Council's representations with regard to the proposed Auckland varnish production bonus had been noted for future consideration The Premier wrote under date October 18th: "I have the honour to acknowledge the receipt of your letter of 10th instant, informing me that your Council consider an injury will be inflicted on the Thames Paint and Varnish Company if a bonus is paid for the production of a certain quantity of varnish, and having made inquiries into the matter, am informed that the Thames company has been in active operation for some years, and that all that is sought is a share of the Government patronage for varnish of a suitable quality which may be manufactured by other firms. Both the above letters were received. ... while the Bests, and the Auckland Varnish Company, did not take at all kindly to Mr Bruce’s remarks. In fact, they were probably spitting tacks by this point. 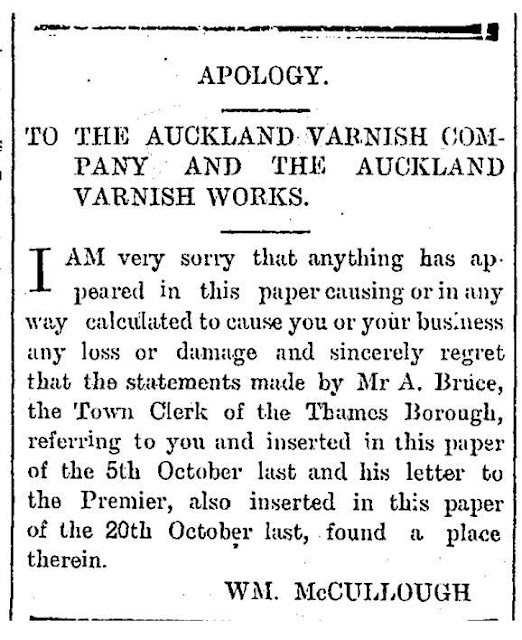 Messrs Whitaker and Baume, on behalf of Best and Co., of Auckland, wrote charging the Town Clerk with uttering a libel in his statements re the Auckland Varnish Works and claiming from him £l00 compensation and the publication of an apology and also a retraction of the statement within seven days.—A claim for £100 and publication of an apology was also made by Whitaker and Baume against the Council in connection with statements in the letter addressed to the Premier.Cr Scott said that as nothing defamatory had been published, liability should be disclaimed.— On Cr Scott's motion, Cr Roberts seconding, it was resolved that the letters be received and that liability be disclaimed. The Thames Star editor duly apologised. 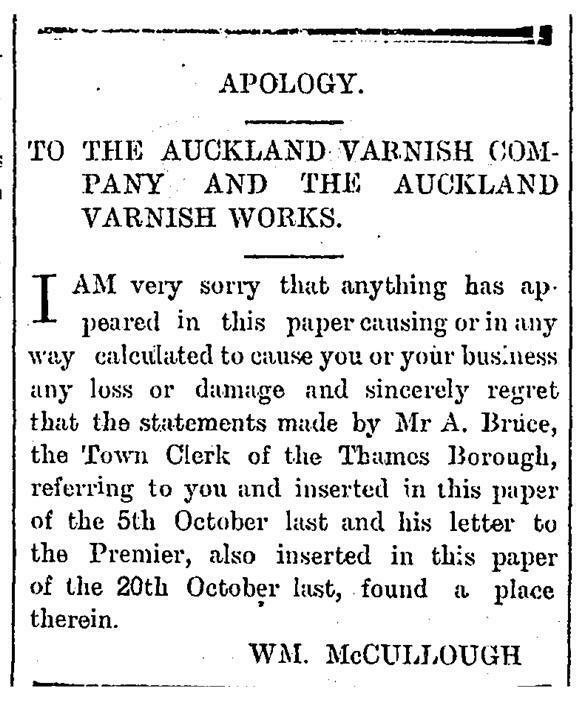 A while before this, it appears, Mr A. Bruce, the local town clerk, happened to be writing to the Government in favour of a subsidy for a varnish factory that was about to start down there, and Mr Bruce saw no reason why this factory should not be subsidised, the same as the one in Auckland. The town clerk, in pointing out the quality of the varnish the new factory intended to turn out, drew a comparison which “bumped just a little bit” against the Auckland Varnish Works. Mac published the letter, and he is now apologising to the A. V. W. for having done so. It is a pretty humble apology, too. Truly, there is no peace for the journalist, any more than for the wicked. And, eventually, so did Albert Bruce, on his own behalf. Odd that the Council he worked for seems to have left him to be hung out to dry on the matter. After all this, the Government came to a decision by August 1901 that they couldn’t give bonuses to encourage the varnish industry anyway. The matter therefore ended. Albert Bruce remained as Thames Borough Council's Town Clerk until 1909.